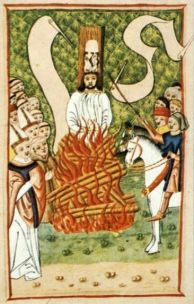 When the Church of Rome found intself in deep crisis in the fifteenth century, the priest and rector of Charles University inPrague, Jan Hus, made a radical attempt to implement a reform of the church and of society on the basis of the message of the Bible. 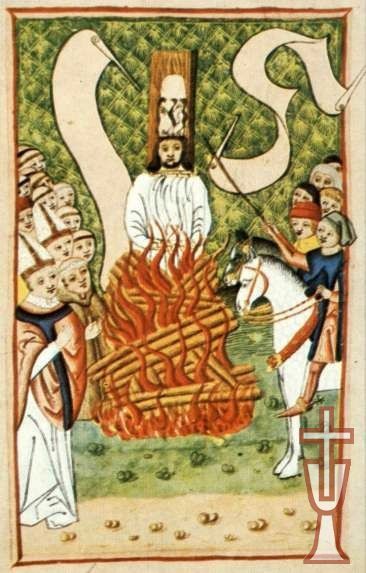 Hus was burned at the stake as a heretic at Constance on 6 July 1415, but his ideas were taken up by a broadly-based movement in the Czech lands, known as the Hussite movement. This Czech Reformation was however silenced for many years after 1620 by the Counter-Reformation, which was allied with the imperial power of the Hapsburgs. An attempt to revive the reform of the church was made towards the end of the nineteenth century by a movement of Roman Catholic priests. Among other things they rejected "Austhro-Catholicity" (linking the power of the church with temporal powerm represented by the Hapsburg monarchy), and endeavoured to renew a faith witch would become a creative force in modern-day life. The First World War (1914-1918) brought these processes to a head. After the end of the war the reforming priests asked the Papal See for understanding of their attempts at reform within the church, but in vain. The founding of the independent Czechoslovak Republic in 1918 encouraged the reforming priests, who were organised in an association called "Focus" led by Roman Catholic priest Karel Farský, to actively implement their reforms. At Christmas 1919 they celebrated the whole of the church service in the Czech language for the first time. This met with such widespread enthusiasm in all sections of the population that it led to the setting up of a separate church, independent of the Papal See in Rome, on 8 January 1920. The independent existence of the new church was publicly proclaimed by Dr. Karel Farský in the church of St. Nicolas on the Old Town Square in Prague on 11 January 1920.